After uninstalling Microsoft Essentials, Windows Defender automatically takes over quietly in the background. 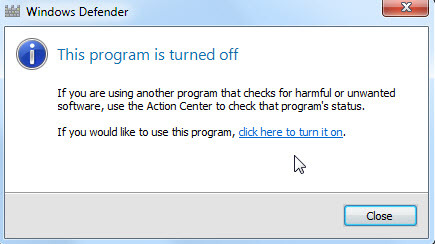 If you want to install another antivirus protection program, you must turn off Windows Defender. In the search box, type, Windows Defender. Click Windows Defender. After it is launched, click Tools and then click options. Click Administrator and uncheck the box that states, “Use this program”, and then click Save. You can now install another antivirus program. In Windows 10 you can turn off Windows Defender real-time protection, but it will only be temporary. Windows will automatically turn real-time protection back on if it’s off for a while. 1) Type edit group policy in the 'Search the web and Windows' textbox on the left side of the taskbar. 2) Click edit group policy from the search results. 3) Within Computer Configuration/Administrative Templates/Windows Components/Windows Defender, Change 'Turn off Windows Defender' from 'Not Configured' or 'Disabled' to 'Enabled'. 1) Type regedit in the 'Search the web and Windows' textbox on the left side of the taskbar. 2) Click regedit (Run Command) from the search results. 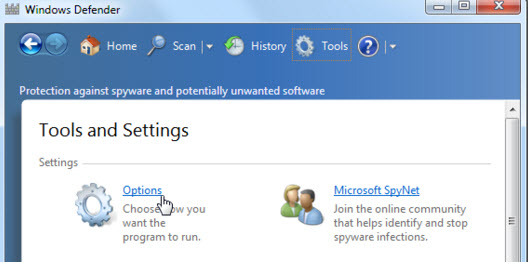 3) Within Computer\HKEY_LOCAL_MACHINE\SOFTWARE\Policies\Microsoft\Windows Defender, Change 'DisabledAntiSpyware' from '0' to '1'. 1) Reboot your computer into Safe Mode. 2) Type regedit in the 'Search the web and Windows' textbox on the left side of the taskbar. 3) Click regedit (Run Command) from the search results. 4)Within Computer\HKEY_LOCAL_MACHINE\SYSTEM\CurrentControlSet\Services\WinDefend, Change 'Start' from '2 - Automatic' to  '4 - Disabled' or '3 - Manual'. 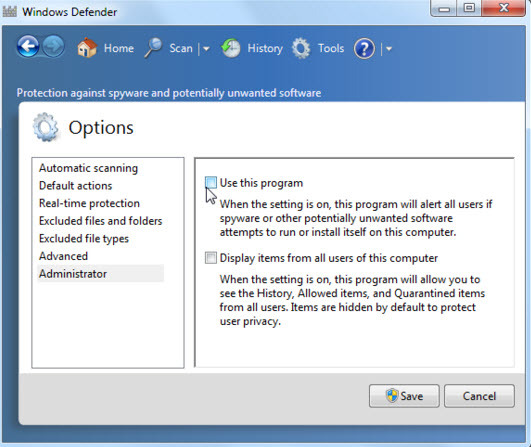 You can turn Windows Defender on with three simple steps by repeating the steps above. Step 2 – Change ‘1’ to ‘0’. Open up Windows Explorer. Go into options and check the box “Show hidden files, folders, and drives”. Also uncheck the box “Hide protected operating system files”. Restart PC or right click on the drive, go to Properties, click the Tools tab, click Check Now button, check the box “automatically fix file system errors”, click the Start button. After the PC restart or scan and fix is complete, the icon should appear. Go back to Windows Explorer and reverse what was done in step 1. I at one time installed Visual Studio 2015 Community Edition. I then uninstalled it, but the uninstall went badly somehow. Weeks or months later, I saw the software lingering in the Programs and Features area where you can modify or uninstall programs. So, I tried to uninstall it again and could not because the package was missing from the Package Cache folder. Now, I don’t claim to understand how all this works and why it just hung when I tried to both uninstall and repair it. All I know is that sometimes I would get a dialog box during the uninstall prompting me to browse for the package that apparently was missing. I did a lot of research and tried a lot of different things. Nothing worked for me. Without that package, I felt doomed…. until I came across this article. I hope this help someone else as it did for me. 2) Open an elevated command prompt. To do this, click Start, type cmd in the Start search box, right-click cmd.exe in the results list, and then click Run as administrator. 3) At the command prompt, type the following command, and then press Enter. 5) Try to repair Visual Studio again. This process could be used on previous version of Windows, but I am only giving instructions for Windows 10. This is a post taken from www.techspot.com. Here’s why: By default, Device Manager only displays drivers of connected devices so the drivers you see in Device Manager aren’t the only USB storage drivers that are really there! You probably still have drivers installed for devices you once connected then disconnected long ago! Windows sometimes installs the same driver for the same device each time you connect it to a different port! You may be surprised at just how many old USB drivers are actually still installed on your machine! NOTE! It must be an elevated command prompt window or the tool won’t work. (If you need instruction, click on the embedded hyperlink in the bullet below.) p.s. Thanks to andrew129260 in helping to highlight this important point! Open an elevated (administrator) command prompt window!! ==> Your output should be similar to my example below. Reboot. Now just replug your devices for fresh clean device reinstalls! 1) On the body of the report, drag a tablix. Make the first row the height and width of your page. Call the Tablix ‘TheTablix’. 2) Drag a rectangle into the first row of the tablix. Call the Tablix ‘TheRectangleRow1’. 3) Left mouse click the rectangle. Click the top left square. Drag the top corner toward the bottom right corner about 3 inches. 4) Left mouse click the body. Right mouse click the body and insert image. Choose Embedded and click import. Click OK. Set the location of the image to 0,0. Change the Sizing to ‘FitProportional’. Call the image, ‘TheImage;. 5) Right mouse click the image, choose layout, and the send backwards. 7) In the Properties window, select your image so it is selected. Paste the size of the rectangle size you copied to the clipboard into the size property of the image. 8) If everything was done correctly, when you click within the borders of the page, the image should be selected in the properties window. From here, you can select a control from the toolbox and draw it over the image. The end result, is the control actually becomes a child of the body and that is what you want. 1) The parent of the controls is ‘TheRectangleRow1’. 3) The parent of ‘TheImage’ is ‘TheRectangleRow1’ but 1 z-order behind the controls. 4) The parent of ‘TheTablix’ is the BODY.